Browse » Home » Thailand » AirAsia: FREE Seats Promotion for 1st October 2014 till 30th April 2015! 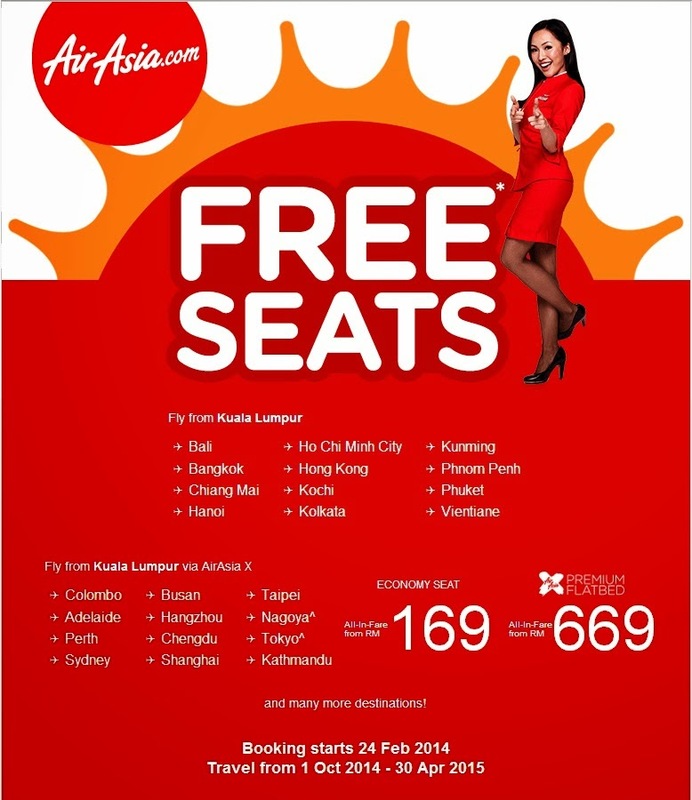 AirAsia: FREE Seats Promotion for 1st October 2014 till 30th April 2015! AirAsia FREE seats promotion is back! Offer is for both domestic and international destinations! Fly from Kuala Lumpur to Bali, Bangkok, Chiang Mai, Ho Chi Minh City, Hong Kong, Kochi, Kolkata, Kunming, Phnom Penh, Phuket, Vientiane and many more destinations with AirAsia's FREE seats promotion (pay only airport taxes & fuel surcharges)! Fly from Kuala Lumpur via AirAsia X to Colombo, Adelaide, Perth, Sydney, Busan, Hangzhou, Chengdu, Shanghai, Taipei, Nagoya, Tokyo, Kathmandu & more from just RM169 (all-in fares)! SEE ALSO: Book a Hotel and get FREE flights to Perth, Sydney, Hangzhou and Chengdu with AirAsiaGO! !